Fones Cliffs is an idyllic and dramatic spot in Richmond County on Virginia's Northern Neck. The extensive forest and high white cliffs rising above the Rappahannock River provide an ideal hunting perch for the hundreds of eagles that migrate through the area, as well as numerous nesting pairs. But a large part of this remarkable place and the wildlife that depend on it is at risk. * A short-sighted, Miami-based developer is petitioning to rezone the land so he can turn this unique and fragile site into parking lots, commercial development, and townhouses. Perhaps there's no one who knows this extraordinary part of the world better than Bill Portlock--educator, naturalist, photographer. With the lens of his camera below, Portlock shows us just how much is at stake if we were to lose this jewel of the Rappahannock. Adult bald eagle. Our national bird inhabits Fones Cliffs in unusually large numbers. There are breeding pairs, sub-adult (eagles that do not reproduce until four or five years old), and non-breeding pairs, including bald eagles from the Canadian Maritimes (in winter) and Florida (during the summer). Photo by Bill Portlock/CBF Staff. Fones Cliffs at Luke's Island with adjacent wetlands. This brackish (a mix of fresh and salt water) marsh leads to the headwaters of Garland Creek where there is a bald eagle communal roost. These roost sites are comprised of non-breeding birds that gather closely together in what is called a larger "concentration zone" of eagles--just one reason Fones Cliffs are so important. Photo by Bill Portlock/CBF Staff. Drake's marsh, a brackish marsh six miles upstream from Fones Cliffs. The cliffs may be seen on the distant left horizon. The dominant wetland plant here is Spartina cynosuroides or Tall Cordgrass. Photo by Bill Portlock/CBF Staff. Caspian Terns have a conversation while resting on a submerged log. Caspian Terns are the largest terns in the world and are found on every continent except Antarctica. They are usually only present on the Rappahannock during their spring and fall migration. Photo by Bill Portlock/CBF Staff. Aerial view of Luke's Island with expansive miles-long view of Fones Cliffs at the top of the photo. Beverly Marsh across the Rappahannock is home to freshwater wetland plants like wild rice, pickerel weed, arrow arum, smartweeds, and many more important wetland plants. It is considered by wildlife biologists to be among the best black duck marshes in the Commonwealth of Virginia. Photo by Bill Portlock/CBF Staff. Canada Geese fly over the Rappahanock River in front of Fones Cliffs on a December day. More than 15,000 wild, migratory Canada Geese like these are regularly observed in annual waterfowl surveys and Christmas Bird Count data from the Rappahannock. Photo by Bill Portlock/CBF Staff. A great blue heron stalks prey along a marsh on the Rappahannock. Great blues feed on fish, crustaceans, and even small mammals. The birds nest colonially and are considered partially migratory along the East Coast. 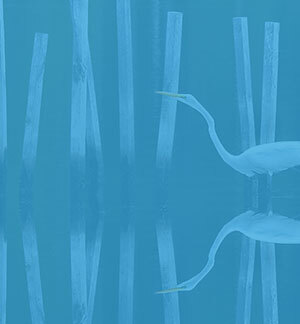 It is not unusual to see great blue herons on rivers in the Bay region every month of the year. Photo by Bill Portlock/CBF Staff. A view of Fones Cliffs from Carter's Wharf in Richmond County. The public boat launch ramp once served as a stop on the 18th-century steamboat route. Photo by Bill Portlock/CBF Staff. Sub adult bald eagle flying along Fones Cliffs. Juvenile, immature bald eagles have brown plumage during their first year. In the second and third years they remain with brown feathers but have irregular white feathers as well, giving a mottled appearance. They attain their unique white head and tail with brown body feathers during their fourth or fifth year. Photo by Bill Portlock/CBF Staff.